This is the recipe as it appeared on the 1962 Adams Best promotional materials. 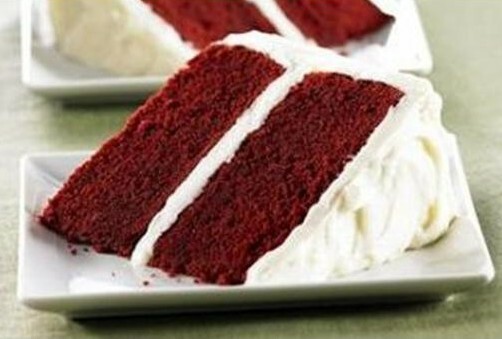 Recipe makes one, three-layer, nine-inch cake. Cream shortening, ad sugar gradually and cream until light and fluffy. Add eggs one at a time, beating vigorously after each addition. Add flavors. Make a paste of cocoa and food coloring and blend in. Sift dry ingredients together and add alternately with buttermilk. Add vinegar with last half of buttermilk. Add vinegar with last half of buttermilk. Beat only until smooth. Bake in 3 greased and floured 8 inch or 9 inch pans for 20-25 minutes at 350 degrees, or until cake tester comes out clean. Cool 10 minutes, remove from pans and cool completely. Sift confectioners sugar. Blend well about 1/2 the sugar with shortening, flavors and salt. Alternately add rest of sugar and enough milk to get a smooth spreading icing.